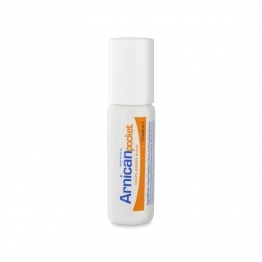 Arnican pocket roll-on is for the local adjunctive therapy in mild trauma (bruises, contusions ...). The roll-on Arnican pocket relieves pain and facilitates the absorption of blows, bumps and blue the whole family from 12 months +. Apply Arnican pocket roll-on the painful area. A repeat 2-3 times per 24 hours. For external use only. Do not use on wounds, mucous membranes and eyes. INC formula I: Aqua, propylene glycol, hydroxyethylcellulose, alcohol, arnica flower extract chamissonis, benzyl alcohol, sorbic acid, polysorbate 20, fragrance, benzyl benzoate, geraniol, limonene, linalool, citronellol.